Please fill out the required fields below (noted with a red *). Additional options will appear based on your answers. The more details you provide, the better we can serve you in your project. This is by no means an agreement to a project; we simply want to help you realize your dream landscape! Also note that this is not an exhaustive list of services we offer or options that may be available to you. Feel free to visit the Services section of our site, or Contact us with any questions or concerns. Dependent on options chosen, a rough estimation for your project will be given at the end of the form. Note that this is just an estimation and that other variables, such as customization, additional fees, and taxes, will affect the final price. What is Your Desired Time Frame for Project Completion? As Soon As Possible 1 Month 3-6 Months Next Year/Upcoming Season No Rush Though this is not a guarantee that we can complete your project in this time frame, we will try our best to accommodate schedules. Approximately What Size Would You Like Your Patio? How long does the seating wall need to be? On average, most seating walls are 20 inches tall. Does this work for you? No problem; we can help! We will note that you wish to discuss more about this subject. How tall does the retaining wall need to be? How long does the retaining wall need to be? How tall does the accent wall need to be? How long does the accent wall need to be? What material would you like the fencing to be? Approximately how long do you want the fencing to be? How many gates does the fence need? Will the fence be on an incline? Are you wanting to replace/extend a current walkway? How wide do you want the walkway? Approximately how long (in feet) do you need the walkway to be? Do you want a straight or curved walkway? Shape and Size of Firepit? Size of Stone Grill Box? What Type of Water Feature? Can You Provide Photos of Your Current Yard/Flower Beds? Are there any specific shrubs or large plants that you would like us to remove? Are there any specific smaller plants that you would like us to remove from the flower beds? Are there plants that are special to you that we should be aware of? Here are a few mulch style and color options. Do you like any of these? We edge all flower beds to create clearly defined lines, are there also tree rings that we need to edge? We typically install fresh mulch at a rate of 3” thick - will the thickness of the current mulch prevent us from doing so? If so, would you like us to remove the old mulch or mulch lightly over top of it? Do you enjoy working outside on lawn upkeep or do you prefer low maintenance landscaping? Do you have any specific material preferences? Tell us about plants or colors you like or dislike, if there are current plants you wish to keep/incorporate into the landscape design, and any details you feel we should know. Are You Looking for a 1-Time Application, or a Fertilization Plan for the Year? We offer standard and custom plans, which one would serve you best? Is your turf patchy (due to grubs)? Show estimated project total? Selecting "yes" will show the estimated price range for your project based on the selections you have made in this form. No problem! 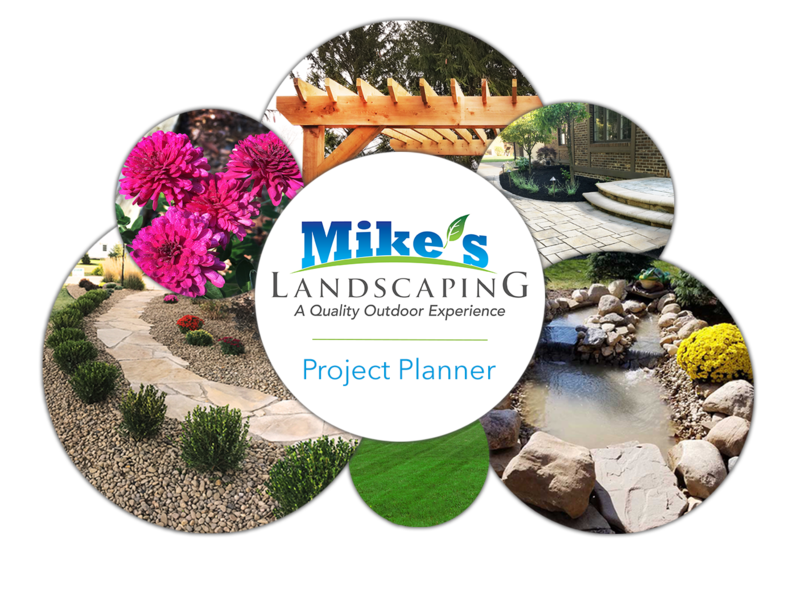 If you need more time to think or if you have questions for us, please give us a call at (740) 601.2629 or email us at office@mikeslandscapingonline.com. If you are ready to begin your project, please submit this form or give us a call (740.601.2629). Note that this is just an estimation and that other variables, such as material choices, customization, additional fees, and taxes, will affect the final price. Remember: this is NOT a legally binding agreement for a project. Your project is not finalized until we receive an official signed estimate form, which your sales representative will provide for you upon meeting with you and discussing details of your project. Note that this is just an estimation and that other variables, such as material choices, customization additional fees, and taxes, will affect the final price. Your project is estimated to cost $15,000 or more. Due to the extent of your project, we recommend you speak with a specialist to ensure your project is given the proper level of attention and detail. Yes! Let's get this going! Please have a representative contact me! I'm not sure. I still have some questions. Please have a representative contact me. No. I'm not quite ready. I still want to look around.